Wait, so his entire civilization exists on a literal chessboard? Who knew that chess was apparently popular throughout the known universe? Nanjiani would be joining Chris Hemsworth, Tessa Thompson and Liam Neeson in the film, which is a pretty damn strong quartet. It will of course be a Thor: Ragnarok reunion for Hemsworth and Thompson, who starred in Taika Waititi’s hilarious Marvel comedy as Thor and Valkyrie, respectively. Here’s hoping that Valkyrie is still alive after the events of Infinity War, something that wasn’t entirely clear in the film. Also not clear: Neeson’s exact role, although we wouldn’t be surprised if he’s moving into the authority position of “Zed” that Rip Torn had in the original Men in Black series. The reboot, directed by F. Gary Gray of The Fate of the Furious, will be the first in the series to move past the Agents K and J characters originated by Tommy Lee Jones and Will Smith. Rather, it will focus on new characters within the contemporary Men in Black universe—notably, Hemsworth as the British Agent H and Thompson as “Molly, a young woman who knows that aliens exist and is determined to become an MIB agent.” Steven Spielberg is executive producing, with a current production window that would put the film out in time for next summer. 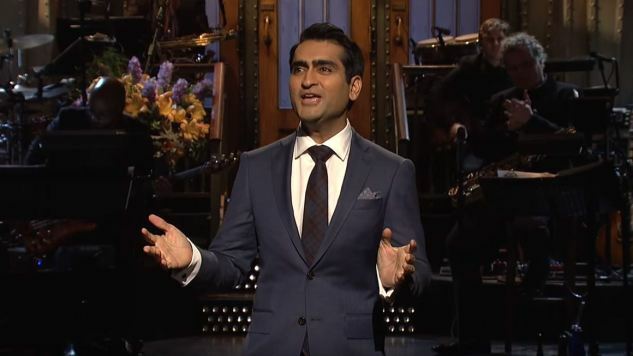 Nanjiani, meanwhile, is coming off a career high-point, as he received his first Academy Award nomination for co-writing The Big Sick, a film with parallels to his own life. It seems safe to say that Men in Black will probably be his most high-exposure acting role to date, especially if the film is treated like a summer blockbuster—which makes sense, given the director and Spielberg as producer. For Nanjiani, it looks like the sky is the limit at this point.